I have a new story out! “Responsibility”, aka “The Story About The Zombie Chickens (I Can’t Believe Anyone Bought This)” is out in the anthology At The Edge from Paper Road Press. 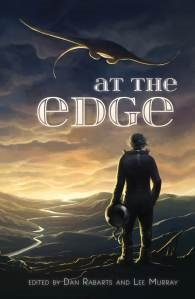 At The Edge is largely a collection of stories from New Zealand and Australian writers, themed around edges and boundaries and liminality. When I saw the call for submissions last year, I knew it was something I wanted to write for. And luckily my story was accepted! Though it has to be said, “Responsibility” is not the kind of story I usually write. For one thing, it’s about zombies. They’re not something I generally gravitate to, but I suppose everyone’s got a zombie story in them somewhere and this is mine. For another, it’s very black-humoured – well, a lot of people seem to find it funny anyway, and I’m not a funny writer in general. Sad and morbid, maybe, but not funny. And I’m embarrassed to say that, zombies aside, it’s based on a true story. A few years back I ended up pet-sitting for my sister while she went overseas for a month. At the time she had two dogs and two cats and six chickens, and she was barely out the door before one of the chooks keeled over. I found it dead in the coop, in classic position: on its back, with rigid little feet in the air. Yes, I know, but I freaked myself out sufficiently that I scuttled out into the storm, in my nightie, to roll a giant planter over the top of the grave, just in case this bloody chicken decided to crawl out of its two foot deep hole and come seeking revenge. Of course it ended up a story. We were born at the same time, my sister and I, born into bodies of opposites. Yet for all that we love each other, though her touch means death and mine does not. Though her house is full of zombies and mine is full of life. But sisterhood comes with responsibility and with care, so when she asks if I will house-sit for her while she goes from Auckland to New Orleans, to speak at conferences of deaths that are not her own, deaths that are dry-toothed while hers run with red, with soft and sinking flesh, I agree. At The Edge (and the rest of the story) can be found at Amazon or Paper Road Press. But actually came to post that, omg, you just posted yesterday that you have a short story coming out! Prolific much? Will seek them both out as soon as time allows. Ha! Yeah, it really was dead. Rigid as concrete in its coop, and stone cold, the poor wee thing. But thunder/lighning plus horror film had a terrible effect on my overactive imagination. You know those times when you KNOW you’re being ridiculous but you just can’t help yourself? That was me.